The map that definitively established Antarctica's continental nature. Chart of the Antarctic Continent Shewing the Icy Barrier Attached to It Discovered by the U.S. Ex. Ex. This important and extraordinary production is Commodore Wilkes's 1840 U.S. Exploring Expedition map of Antarctica. Of extraordinary importance to Antarctica collectors, the surveying of this coast and this resulting map are the first to definitively prove Antarctica's continental nature. Among the many great achievements of the U.S. Exploring Expedition, and Wilkes specifically, the surveying of the Antarctic coast now known as Wilkes Land, stands out as the most significant. 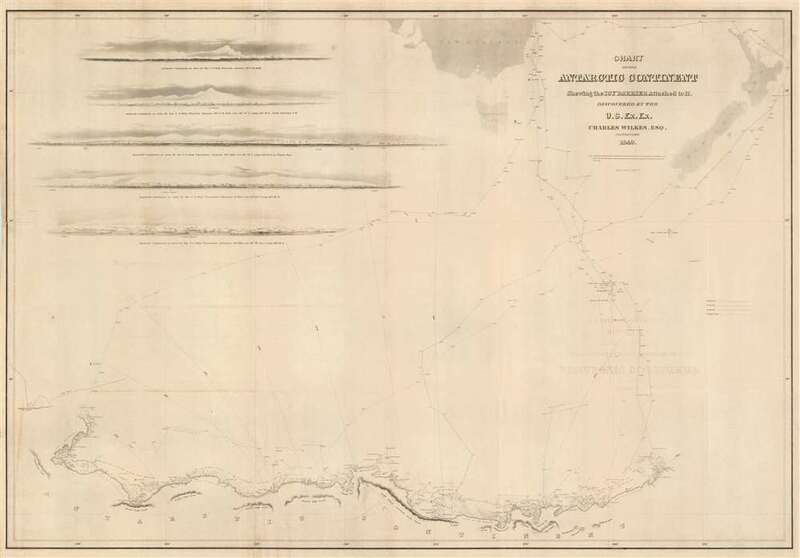 The chart covers that portions of Antarctica now known as Wilkes Land, located due south of New Zealand and Australia (ghosted in at the top of this chart), roughly from Cape Hordern (100°31' E) to Point Alden (142°02' E). Five profile charts in the upper left quadrant offer views of the Antarctic shoreline. This map was prepared by Charles Wilkes and engraved by Sherman & Smith. Despite being dated 1840, and copyrighted in 1844, it was first published by Lea & Blanchard of Philadelphia to illustrate the atlas volume of the 1845 first edition of Wilkes's official U. S. Ex. Ex. report. Collectors will note that most of the maps from Wilkes' official report of the U.S. Exploring Expedition were issued in small and large formats. This is the large format edition and is exceptionally scarce. The full run consisted of only 150 presentation copes and 100 official copies. Twenty-five of these are known to have been lost in a fire, leaving only 225 possible examples. collect, preserve, and arrange every thing valuable in the whole range of natural history, from the minute madrapore to the huge spermaceti, and accurately describe that which cannot be preserved. The expedition lasted from 1838-1842. Wilkes gained the reputation for being a harsh and dictatorial leader often at odds with his sailors and sub commanders - so much so that some suggest he was the real life inspiration for Herman Melville's characterization of Captain Ahab. Nonetheless, the U.S. Ex. Ex. was a resounding success with long term political and scientific ramifications. Under Wilkes, the expedition surveyed 1500 miles of the Antarctic continent, mapped over 280 islands, explored over 800 miles of the Pacific Northwest, and catalogued over 60,000 plant and bird specimens. Despite his scientific achievements, the end of the expedition Wilkes was court-martialed for the loss of one of his ships on the Columbia River, for the regular mistreatment of his subordinate officers, and for excessive punishment of his sailors. He was acquitted on all charges except illegally punishing the men in his squadron. During this post-expedition period he was also employed by the U.S. Coast Survey, but it was mostly an honorary position with most of his energies being focused on preparing the influential five volume expedition report. Later, during the American Civil War (1861–1865) Wilkes commanded a Union naval vessel in the Trent Affair, a diplomatic incident in which Wilkes intercepted the British mail packet RMS Trent and removed, as contraband of war, two Confederate diplomats, James Mason and John Slidell. Wilkes died in Washington, D. C. on February 8, 1877 at the rank of Rear Admiral. In August 1909, the United States moved his remains to Arlington National Cemetery. His gravestone reads "he discovered the Ant-arctic continent". Wilkes, C., Atlas. Narrative of the United States Exploring Expedition During the Years 1838, 1839, 1840, 1841, 1842, (Philadelphia: Lea & Blanchard) 1845. Very good. Backed with linen as issued. Overall toning. Some wear on original fold lines. As in most examples, lower left margin partially trimmed to neat line. Rumsey 4442.002. Forbes, D. W., Hawaiian National Bibliography 1780 - 1900: 1831-1850, 1573. Hill (II) #1866. Rosove, M, Antarctica, 1772-1922, 353. Streeter Sale 3324.